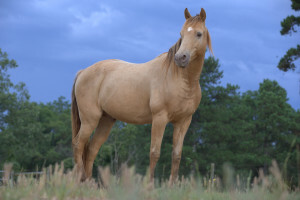 THUNDER is our first equine ambassador, whom we lovingly brought into the fold when acquiring our new property in Warm Springs, Georgia. Thunder is a super friendly fella and greets everyone who enters the grounds with good vibes and a healthy curiosity. Won't you consider helping us to care for Thunder so that he can remain happy, well and strong in his ability to connect with others so that we may all experience and celebrate the beautiful bond we have with animals! ECLIPSE and MAGIC are daughter and mother who both were living on the property when we moved to it in 2016. Magic only has one eye as she lost her other eye to an infection years ago. Both of these beautiful equine ladies were part of a horse breeding farm from which they are now freed. Both mother and daughter suffer from Cushing's Disease, so they are on a daily medication regiment that they happily take inside apples and/or carrots!